For a while, Apple has been selling two generations of iPod touch side by side: the 16GB and 32GB, 3.5-inch, Retina display fourth-generation versions and the 32GB and 64GB, 4-inch, Retina fifth-generation models. That confusion finally ended when Apple recently introduced a 4-inch 16GB iPod touch and in the process killed off the older fourth-generation for good. Did I say the confusion ended? Well, sort of. 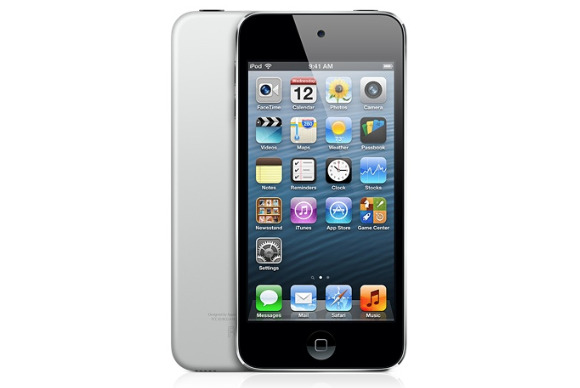 In most ways, the $229 16GB fifth-generation iPod touch is identical to the 32- and 64GB fifth-generation models released in October 2012. It has the same 4-inch Retina display, the same dual-core A5 processor, the same front-facing FaceTime HD camera (with its 1.2-megapixel photos and 720p video capabilities), the same bundled Lightning cable and remote-less EarPods, and the same dimensions. The 16GB model is in fact notable only for what it lacks: It offers no rear-facing iSight camera, no strap post (and therefore no strap), and no choice in colors (this model comes only with a black face and silver back). Given that it has no new or improved capabilities over its higher-capacity siblings, your buying choice is nicely narrowed down to just a few factors: Money, storage space, and what you want from an iPod touch’s camera. The colorful 32GB and 64GB models (left) and the new 16GB model (right). The money portion of the equation is simple enough. This iPod is $70 less than the next model. If your iPod budget doesn’t run to $300 but you still want a (very capable) iPod touch, this is the one you’ll get. How much capacity you need depends on how you intend to use a device like this. If you plan to stream—rather than store—a lot of media and aren’t the kind of serious gamer who hopes to load countless storage-sucking diversions on your iOS device, the 16GB it offers may meet your needs perfectly. If you’re more of an “I want a lot of media and apps with me all the time” person, you’d be better served by the 32- or 64GB model. And then there’s the lack of a rear-facing camera. The front-facing camera is great for FaceTime and “selfies,” but the presence of just that single camera is going to put a serious dent in your Instagram, YouTube, and Facebook lives. We increasingly share videos and images over social networking services, and that requires a camera that allows you to frame your subjects. For the most part, a front-facing camera doesn’t allow that—unless you’re the kind of person who shares pictures and videos of yourself almost exclusively. And that introduces the dilemma of the 16GB iPod touch as a gift, particularly for younger people. Its price makes it a natural. But, for many, the inability to use that gift for a favorite social activity means it won’t be nearly as welcome as the higher-priced iPod touches. While this is hardly a “buyer beware” caveat, those considering this iPod as a gift will want to be aware of just how much the recipient uses social media. The fifth-generation iPod touch is the greatest iPod of its kind that Apple’s made. But the somewhat stripped-down 16GB model makes some definite compromises to offer the same screen size and processing power as its higher-capacity brethren at a more entry-level price. For many people the lack of color choices and wrist strap won’t be that important. The missing rear-facing iSight camera, with its 5-megapixel photos and 1080p video, may give you pause, however. It’s great that Apple has again more or less aligned the specs across its touch line, but for $70 more than the 16GB model, the full iPod touch experience awaits—along with twice the storage capacity, to boot. As long as you know what you (or your recipient) is getting into, the $229 16GB model is a nice addition, but it might not meet the needs of some touch users.